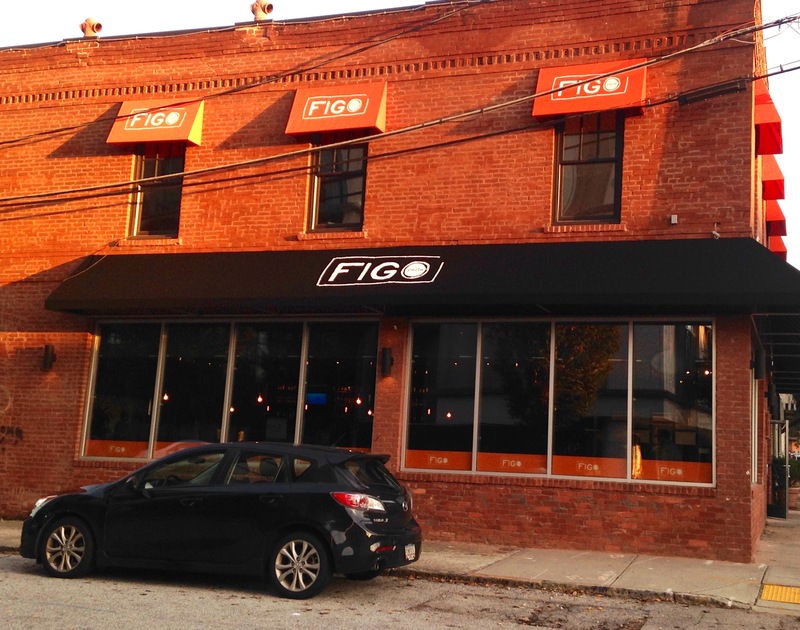 Figo Pasta is a modern Atlanta success story. In 2002, they opened up a tiny restaurant off Collier Road. Fast forward thirteen years and there are six restaurants throughout Atlanta including the one in West Midtown that we are visiting tonight. Figo has been in this location for a year, and that’s why we have been invited to their anniversary party. Here’s a building with character. 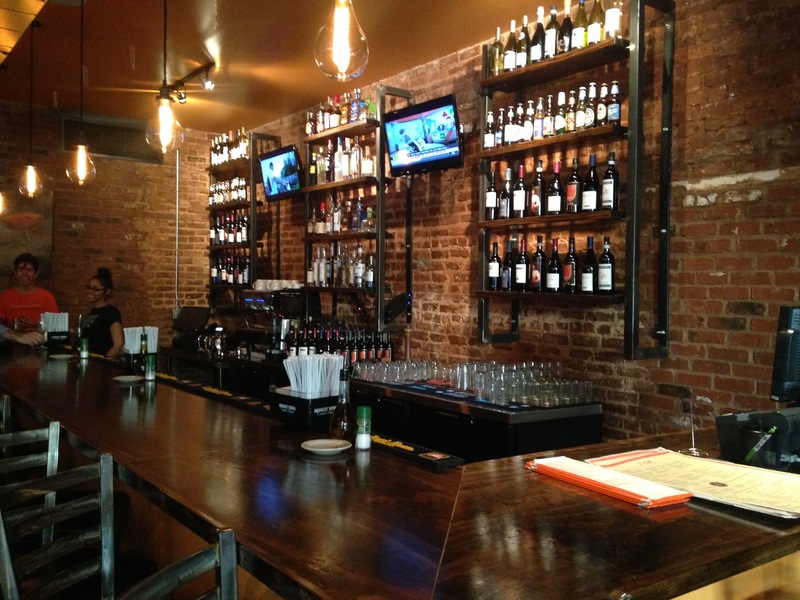 The brick walls show through on the inside as well, giving this an old warehouse vibe. This location replaces Pasta Figo #2, a long-time staple off of Howell Mill Rd. in the White Provisions complex that we visited back in October of 2013. Evidently, a lot of people think the old place was torn down and the restaurant went away. Not so. Things are going well in the new digs a couple of miles away. It’s nice to see a restaurant that’s not in a strip shopping center. It’s also nice to meet owner Sandro Romagnoli and his lovely family. What nice, welcoming people. They are here greeting guests and working the room. 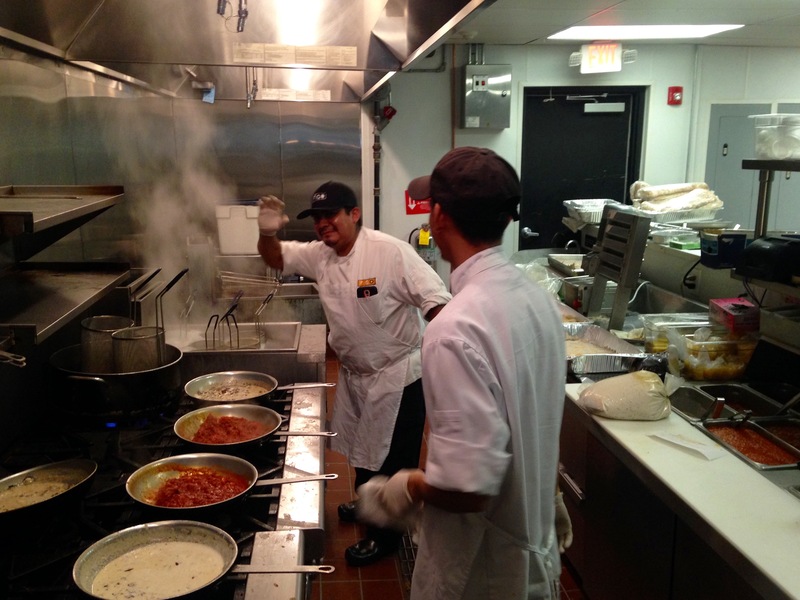 While the Romagnoli family works the room, these guys are working the kitchen. Servers mingle with wine, champagne, and trays of appetizers. This is the first one we see. On the left is the coconut ginger carrot soup. This is really good and with colder temperatures approaching, I could easily eat a whole bowl of this. The caprino spread next to it has goat cheese and apricots. The next tray had our favorites of the night. Caprese salad on a stick is brilliant. 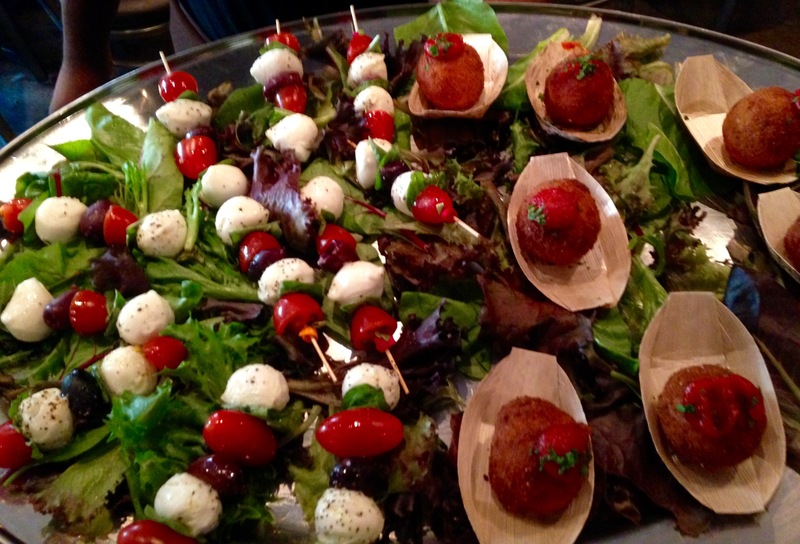 Tiny balls of mozzarella are laced with basil, cherry tomatoes, and an olive. What a great idea for a passed appetizer. The balls of arancini are the best things I eat tonight. Rice is stuffed with mozzarella cheese and then fried. I will admit that I had more than one of each item on this plate. Figo makes their pasta fresh every day. This is pasta the way your Italian grandmother makes it. We are able to sample four dishes tonight. Lucky us–two of them are the specials in November. 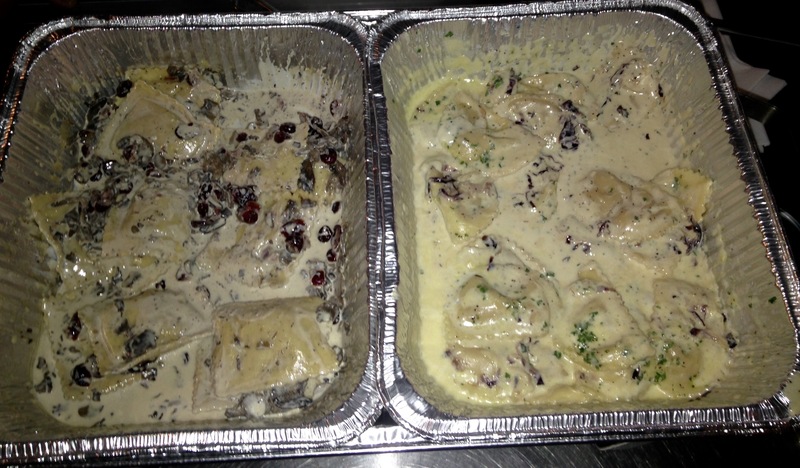 On the left is the turducken ravioli. Just like a real turducken, it has turkey, duck, and chicken for its filling. The mushroom sauce is pretty overpowering and you can’t taste the fillings as well as you can in our second dish. That’s the pumpkin and marscapone cheese ravioli. It reminds us a lot of the famous Figo butternut squash ravioli. Vegetarians should run over while you can to get this dish. It is our favorite of the night. Here’s our other two choices. 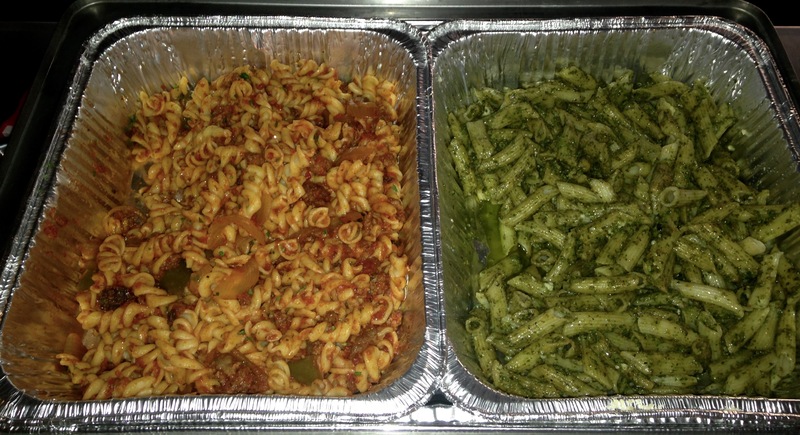 Can you tell which one is the basil pesto pasta? It’s the green one that was full of basil and garlic. Sharing the heating tray is fusilli in a sausage pepper and onion sauce. We are not pepper and onion people and would never order this, but it is nice to try everything. 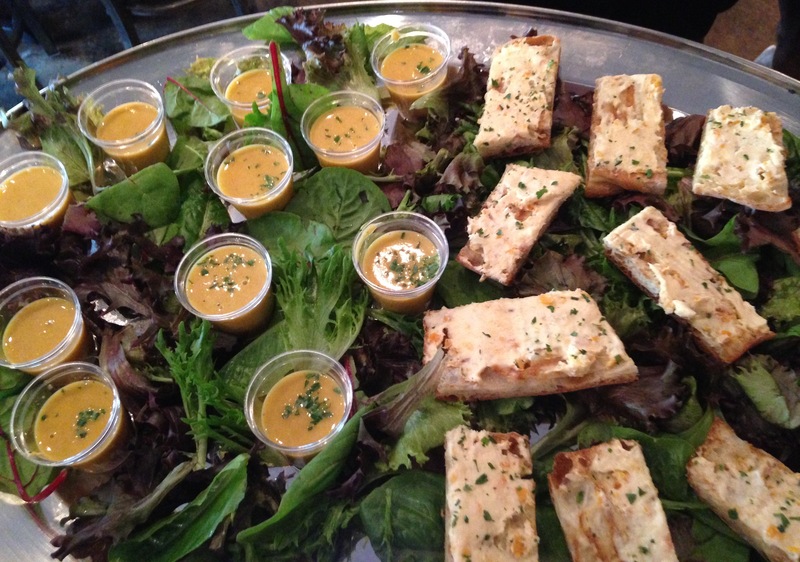 We should probably mention that Figo caters and you can serve all of this food at your next party. 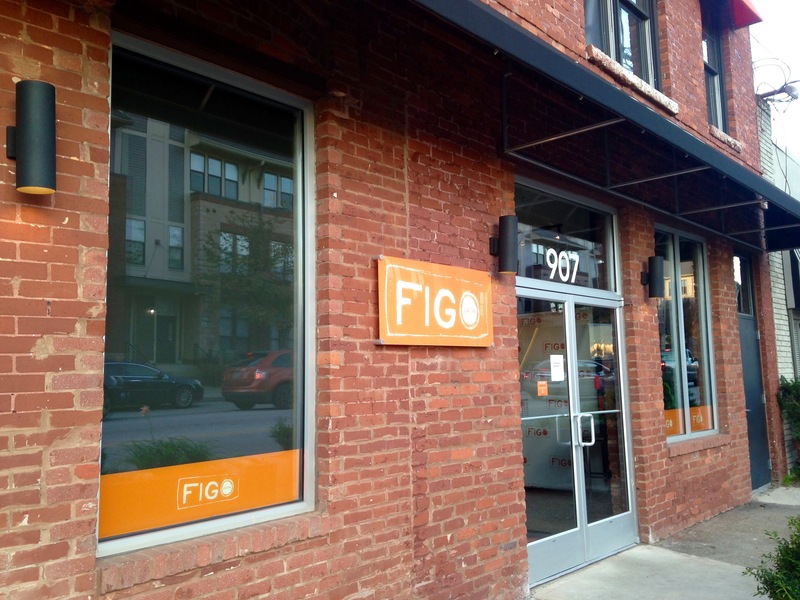 So happy anniversary in your “new” location on Marietta Street, Figo Pasta. We wish you many more years of success here. Disclaimer time: This was a media dinner and Date Night did not pay for our food or drinks. Our words, however, are priceless. Thanks to Nicole Hunnicutt and the nice people at Melissa Libby and Associates for the invitation. Next Post Fabiano’s Pizza: Worth the Wait in Newnan?